This assignment included an evaluation of several sections of books written on translations and approaches. The reading assignments were specifically geared toward the translation of the Hebrew Bible, but the principles and methods can apply to the Greek Bible as well. Enjoy! The Bible was originally written in Hebrew, Aramaic, and Greek. In order to make God’s Word available to all men and women translation must occur. As with any work of translation, certain methods and practices must be followed in order to achieve the desired goal. But before the methods can be discussed, the discussion on how to translate must take place. In other words, what constitutes a proper translation? Is it enough to simply translate word for word without regards to a logical and coherent sense? For instance, if one were to translate a paragraph from Hebrew to English, word for word, would the English translation convey the information found in Hebrew? These are difficult questions, and questions that many scholars and translators have sought to answer. The presence of debate and questions does not negate the fact that a balance must be reached between conveying the meaning of Scripture while also following the structure of the Hebrew and Greek languages. Duvall and Hays described what they believed to be the goal of translation when they wrote, “Translation is nothing more than transferring the message of one language into another language.” However, as Fox pointed out, there is more to translation than simply conveying a meaning. So translators must be able to convey both the message, the way it would have been received, and the method by which it was communicated. To begin with, translators are faced with the barrier between what Duvall and Hays called the “receptor language” and the “source language”. In Grasping God’s Word, the two provide an example from a verse in the New Testament in which a literal, word by word translation is given. To the common English speaking person the verse would make little to no sense. Because of this, they wrote, “Is a translation better if it tries to match each word in the source language with a corresponding word in a receptor language? Could you even read an entire Bible ‘translated’ this way?” The answer is a qualified no. Because the differences in languages it would be rather difficult to translate every nuance found in the original languages. This problem is particularly acute in the Hebrew Bible. 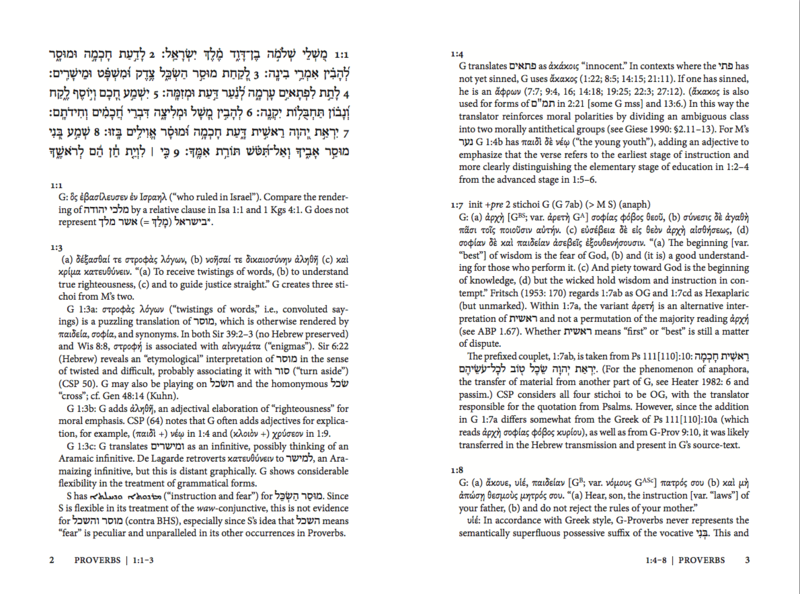 The gap between the meaning of the Old Testament Hebrew and the translation into English led one author to state that modern translations “have placed readers at a grotesque distance from…its original language.” Perhaps the issue of the translation of the structure of the “source language” is no more significant than in Old Testament narrative prose. The difficulty lies in balancing the ability to communicate the meaning without sacrificing the beauty and the nuances of the Hebrew language. For example, Alter raised the point that English translations fail to properly translate the “waw conversive.” In Genesis 24.16-21 Rebekah draws water for Abraham’s servant. She then proceeds to provide water for all his camels. The waw conversive is used “to denote sequences of consecutive actions…” which would have provided the English readers with the impression that Rebekah did not stop getting water for the camels for a long time. The idea the Hebrew author was attempting to convey is that Rebekah continuously filled her bucket in order to rehydrate the camels. This particular example is not found in many English translations. There are additional examples, but it should become apparent that there are shortcomings in many English translations that fail to produce an accurate reflection of Hebrew thought. The next text of the translator is to determine the method of translating. There are predominately two main lines of translation: “dynamic equivalence” and “formal equivalence.” The selection of these two methods depends upon the translator’s goal, i.e. meaning or accuracy in regards to the original. While some translations aspire to be “more functional”, they often failure to communicate the nuances similar to the examples provided above. Others strive to present the most accurate reflection of the original languages but fail to provide the reader with a comprehensible piece of literature. No doubt the business of translation is extremely demanding. On one hand the translator must be able to provide a meaningful transition between two languages; on the other hand he must also be able to communicate the original message in its original literary structure. But there are safe guards that some scholars have developed in order to protect the integrity of the original language while allowing the message to be communicated in modern vernacular. Fox provides a lengthy discussion on how Hebrew translation can be accomplished with the above goal. And Thomas lists the several steps of the “deviation test” in which translators have the ability to objectively examine their own as well as other translations. Using the methods provide by scholars in conjunction with the balanced approach of dynamic and formal equivalence, translators today can provide the English speaking world (or any language) with an accurate version of God’s Word. J. Scott Duvall and J. Daniel Hays, Grasping God’s Word: A Hands-on Approach to Reading, Interpreting, and Applying the Bible (Grand Rapids, Mich.: Zondervan, 2001), 23. Robert L. Thomas, How to Choose a Bible Version: An Introductory Guide to English Translations (Fearn: Mentor, 2000), 89-100. See, for example, Grasping God’s Word; How to Choose a Bible Version; and David Horton, The Portable Seminary (Minneapolis, Minn.: Bethany House, 2006), 76, 463, 506, and 569. Everett Fox, The Five Books of Moses: Genesis, Exodus, Leviticus, Numbers, Deuteronomy ; a New Translation with Introductions, Commentary, and Notes (New York: Schocken Books, 1995), xii; xxiii. Duvall and Hays, 33. The “receptor language” is the language into which the translation is being made; the “source languages” are the original languages, i.e. : Hebrew, Aramaic, and Greek. Duvall and Hays provide several of those difficulties by quoting D. A. Carson, 33-34. From D. A. Carson, The Inclusive-language Debate: A Plea for Realism (Grand Rapids, Mich.: Baker Books, 1998), 48-51. Robert Alter, Genesis: A Translation and Commentary (New York: W.W. Norton, 1996), x. For a detailed treatment of the topic, see Fox; Thomas; and Alter. Alter, xix and xxi; see also Gary Davis Pratico, and Miles V. Pelt, Basics of Biblical Hebrew Grammar (Grand Rapids, Mich.: Zondervan, 2001), 192-194. Referring to camels ability to consume large amounts of water, “The body rehydrates within minutes of a long drink, absorbing over 100 litres (25 gallons) in 5–10 minutes.” Encyclopædia Britannica Online, s. v. “camel,” accessed September 21, 2014, http://www.britannica.com.proxygsu-lrb1.galileo.usg.edu/EBchecked/topic/90756/camel. Alter raised this point, writing, “the translator’s task, then, is to mirror the repetition as much as is feasible”, xxviii. He went on to discuss the importance of word order and word location that is often lacking in English translations, xxxi and xxxiii. Thomas, 89-90. Duvall and Hays use the descriptions of a “more formal approach” and a “more functional approach”. Duvall and Hays, 35. They point out the necessity of balance when they write, “Formal translations run the risk of sacrificing meaning for the sake of maintain form.” Ibid., 35. Referring to the functional approach they warn, “The functional approach is not always as sensitive as it should be to the wording and structure of the source language.” Ibid. Scholars seem to agree that a balance is needed. See Fox, xxiii; Duvall and Hays, 34-38. Duvall and Hays, 35. They list the following translations utilizing this method of translation: New Living Translation and the Good News Bible. Ibid., 35. They list the following translations that practice this method: New American Standard Bible, Holman Christian Standard Bible, and the English Standard Version. Thomas, 90-100. There are five steps: number approximately 30-50 words in the original language; translate the words into the English equivalent as closely as possible; arrange the words in compliance with the original word order until the words make sense (Thomas calls this “minimal transfer”); compare the numerical values to determine the deviation of the translations; one additional step is to complete the process again until a sufficient amount of samples has been obtained to provide an accurate representation of the deviation value of a given translation.